It may be hard to visualize if you’ve been through drought-stricken southern California lately, but much of what’s now Los Angeles was once a teeming wetland. And a new landmark survey going back 8,000 years has found that human settlement in the region has ebbed and flowed with the levels of the sea and the waters of the Los Angeles River. Since 1989, a team of scientists has conducted scores of archaeological surveys, drilled dozens of cores into the coastal soil, and pored over countless microscopic fossils to reconstruct the environmental and human history of Los Angeles. They found that the historical heart of L.A. has been the marshy flats now known as the Ballona wetlands. 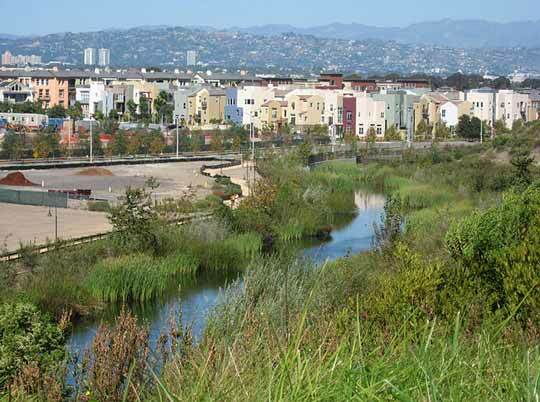 Today, the wetlands are little more than a grassy inlet near the upscale development of Marina del Rey. 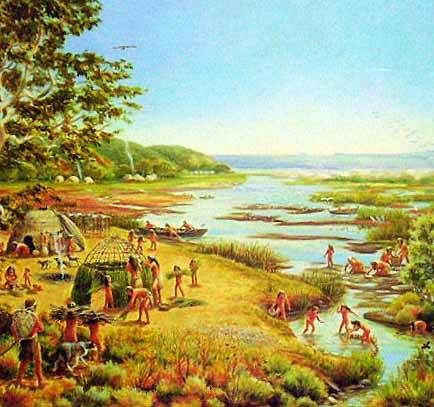 But for much of prehistory, according to the team’s results, human habitation in the region only flourished when those wetlands were at their healthiest. “This is one of the largest and most important archaeological studies ever conducted in southern California,” said Dr. Richard Ciolek-Torello of Statistical Research, Inc., who helped lead more than 100 archaeologists in the research. From a somewhat mysterious thousand-year abandonment of the region around 4000 B.C.E. to an equally sudden population explosion some 2,000 years ago, he said, the history of ancient L.A. seems to have been driven by its coastal marshes. “Although other studies have dealt with aspects of aboriginal life or certain time periods, our studies deal with the entire sequence of occupation from the first evidence of human settlement in the Ballona area to the abandonment of the last site,” he said. Part of the research involved drilling 29 cores, each 15 meters deep, to map where and when different sediments were laid down as the landscape changed. Meanwhile, teams of archaeologists reviewed decades’ worth of previous research, and conducted their own investigations. “We excavated thousands of cubic meters of soil,” Ciolek-Torello said — from El Segundo, where great hills of wind-blown sand once stood, to the inland neighborhood of Baldwin Hills, which used to overlook the coastal plain. They report their results in the Journal of Wetland Archaeology. Any sites from that long ago are likely underwater, they explain, as sea levels rose by some 20 meters after the last great glacial melt. Instead, the earliest evidence of human life on what’s now dry land can be found overlooking the Ballona wetlands, where sites dated to 8,000 years ago have been found, harking back to when the area was a wide, shallow bay protected from the ocean by barrier islands formed by windblown sand. There, big middens of processed shellfish like scallops and chione have been discovered, along with the remnants of animal bones and stone tools, the team reports. Over the millennia, sediments from the Los Angeles River gradually closed off the barrier islands, turning the Ballona’s open bay into an enclosed estuary, where saltwater mingled with fresh. But around 6,000 years ago, the research found, evidence of human activity seems to vanish for nearly a thousand years. But both time and tide continued, and the study’s evidence suggests that the population of ancient Los Angeles reached its peak between 2,000 and 3,000 years ago, when several hundred families settled on the bluffs overlooking the Ballona. This population boom coincides with what Ciolek-Torello’s colleagues call “one of the most dramatic wet episodes during the last 8000 years,” with sediment samples indicating that unusually heavy rains persisted over a period of about three centuries. During this time, L.A.’s wetlands were at their most productive, and evidence suggests that their inhabitants made the most of the fecundity, hunting deer and rabbits, milling seeds, and harvesting shellfish, sharks, and rays. Hundreds of residential features and middens of trash have been found from this era, as well as a diverse array of artifacts and evidence of cremations and burials, suggesting a variety of social groups made their homes here, including the predecessors of the Tongva and Chumash who continue to call this region home. With the arrival of the Spanish and 1541 and the establishment of the first missions in the 1771, the rest is largely a matter of historical record, and more is preserved in the histories recounted by the Tongva and Chumash. For Ciolek-Torello’s team, the past 20 years of research demonstrate the importance of the once-wild waters that continue to flow through L.A., though now mostly they move through concrete channels. “[The results] teach us that climatic and environmental conditions are constantly changing—often dramatically,” Ciolek-Torello said. “Some changes occur over periods of thousands of years, others over the course of centuries, and still others in a generation or a period of a few years. “This is very important today when we worry about global warming. Such events have occurred repeatedly in the past … and we must recognize that we may be unable to control these changes. “Aboriginal people led a mobile lifestyle that allowed them to move to other areas as local conditions deteriorated,” he added. “Although there is a lot of mobility in our society, we really don’t have the option to abandon the L.A. Basin during periods of drought or flood. I grew up in West Culver City and always wondered about the bluffs that run for miles north of Venice Blvd. They can be traced from west of La Cienega to Lincoln Blvd, with indentations created by creeks running in from Cheviot Hills and Westwood. I’ve thought that the steep sides of some of these bluffs probably resulted from erosion created by intermittent large floods. Steep-sided bluffs further south from Baldwin Hills to the ocean also suggest erosion from large floods. This article suggests to me that these types of floods might have created the Ballona wetlands and nourished them for thousands of years.